Ganesh is one of the most popular Hindu Gods. He is also called Ganapati or Ganesha or Vinayaka. He is believed to be the remover of all obstacles. The idol comes in a plastic case to protect it from dust. 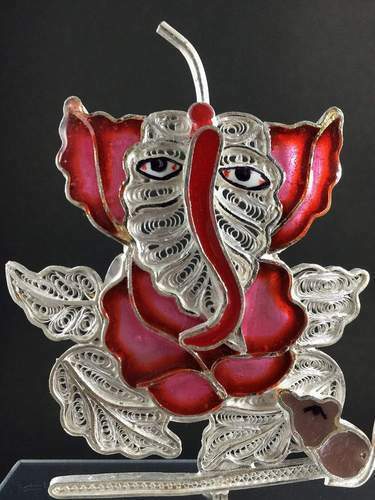 SP009 : Silver Filigree Ganesh. The item comes in various sizes (breadth x height). The size of the plastic case is given below. Silver Linings is an online shopping destination for Silver Filigree Jewellery and Gift Items handcrafted in Cuttack. Silver Filigree is a fine art of silver. We sell jewellery, gift items and corporate gifting items in Silver Filigree.